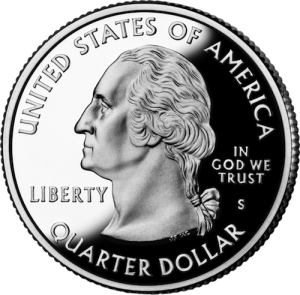 It has been over fourteen years since the first state quarter was released (January 1, 1999 – Delaware). All fifty are in circulation with Hawaii being the last state quarter minted in 2008. Despite their unique artwork, they generally go unnoticed; it is just a quarter, but they do have similarities among them. See if you can recall some of the details they exhibit as featured in this quiz about U.S. quarters. There should be no cheating for you who are collectors! A. Which quarter has a gun on it? B. On which state quarter would you find a duck? C. Which state has a cow on it? D. How many state quarters have horses depicted? E. Which states have American bison (buffalo) on them? F. How many states have a fish on them? G. Which one has an astronaut on it? H. How many states have a trumpet displayed? I. Which one has the most presidents depicted? J. How many states depict the state’s boundary or outline on them? K. Which state quarter has a race car on it? L. How many states display a boat or some sort of water craft within the design? New Testament Christian Church's new online-monthly newsletter will bring all the Trumpet magazine articles you're familiar with and more, right to your inbox! This exciting, new website duo lets you share with others using Facebook, Twitter and other social-networking software; download and print relevant articles for use in preaching; explore our sources of publication via links on the pages; contribute your thoughts using comments. Rollover Calendar dates to get a popup of articles, or navigate the Categories menu to get every article of a certain type. The Archive menu will let you search by the month of publication. Choose http://www.ntccgoodnews.org for news, events and information about NTCC. You can access this site using the Links menu at the top of the page. Or choose http://ntccgoodnews.com to read 'The Good Report Newsletter.' Be sure to bookmark both sites and visit regularly, as new material will be published throughout the month also. Enjoy!